"The history of cinema has been considered a separate entity to that of other art forms, primarily due to its connections with commerce. My approach to film counters this for I consider film to have a place amongst the other arts. Nevertheless, film does have qualities unique to itself, particularly in regard to its treatment of time and its relationship with an audience. The time a gallery visitor spends looking at a painting or sculpture is up to them; a cinema audience, on the other hand, is bound by the film’s own duration. While the audience experiences the film’s visual and sonic display, nonetheless, they are free to dwell into their own imagination. What fascinates me most about film expression is the potential for what is presented on the screen to collide with each individual viewer’s emotional landscape, and the new ‘image’ created inside the viewer’s mind resulting from this collision. Like news reports of wartime Japan, films with stories or a precise structure throw images at an audience with their meanings already intact. Rather than making films with my own imposed structure, my method is to abandon structure altogether or, in other words, layer images that once embodied meaning on top of one another until they become unintelligible. I aim for the resulting composite ‘image’ to be like a nameless animate being with a limitless capacity for meanings, so that my films become triggers for an audience to venture into their own imagination. In commercial films, the techniques of superimposition and multiple exposure are tired signifiers to indicate a transition between scenes or a departure into a dream state. However, I see new potentials in these techniques. . I believe people do not come up with things out of the blue but, instead, combine different things in their own ways to arrive at something new – collages and multiple exposure as techniques, for me, artistically deal with this very notion. In the layering of existing matter, my filmmaking method is to take images into territory even I cannot foresee and allow for them to flourish in their newfound environment. My approach to sound similarly rejects synchronisation in favour of inserting audio and music seemingly unrelated to the images. My collaborations with musicians from overseas have been, in one sense, a way to stage such unforeseeable encounters." The experience of watching Takashi Makino’s work is perhaps best expressed by the title of one of his films: "still in cosmos". On the one hand, the filmmaker attempts to create a pure frenzy through the use of multiple exposure and superimposition, but there always remains a notion that abstract chaos exists within some sort of greater order. This paradoxical tension has persisted in all aspects of his filmmaking. At times his films confront you with the visual equivalent of a shriek; in other moments, they feel completely tranquil. Makino’s cinema is steeped in the avant-garde traditions of abstract animation and artisanal practice represented by the likes of Jordan Belson and Stan Brakhage, but the techniques that he employs involving digital transfers, increased frame rates, and multiple layering also push digital technology forward to the edge of its current abilities. While his films may appear transcendent and otherworldly, they are mostly composed of images or renders from this world, These moments illuminate with blinding intensity but are always full of shadows. Such tensions are the foundation of his practice. 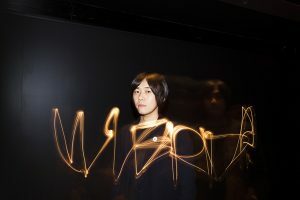 Although Makino’s aesthetic continues to eschew story, character, and dialogue, his recent films have marked several turning points that have taken his artistic practice in a new direction. 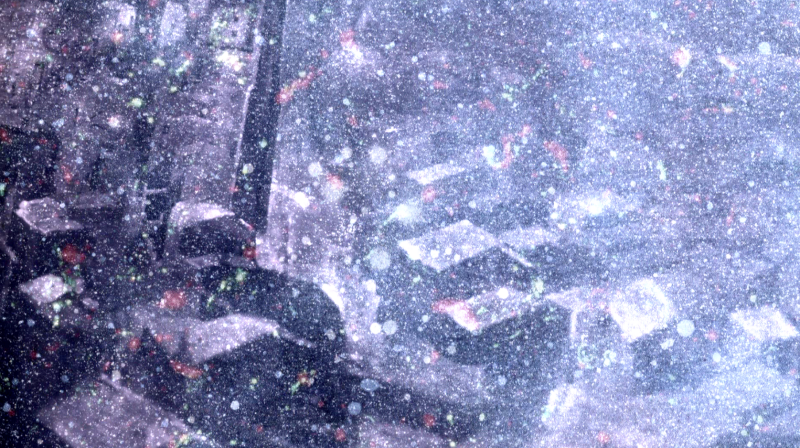 In 2012, Makino shoots with a digital camera and employs the Pulfrich 3-D effect to portray images of ripples spreading on a river surface; Phantom Nebula (2014) is his first foray into found-footage filmmaking where human shadows emerge from the dust and scratches accumulated on the filmstrip; and with Space Noise (2013-14), in addition to performing haunting ambient noise himself, he has turned it into an amorphous multi-projection work that changes with every presentation. Borrowing its title from a treatise by Aristotle, the latest film by Makino Takashi is an abstract work that finds its drive in the clash between light and darkness. Entirely composed of superimposed images of Tokyo’s landscape and water sites, the film takes its rhythm from the cycles of repetition that are the pillars of life and civilization. As light emerges from the chaos, Jim O’Rourke’s ambient drone sets the tone for what is to come. After the research of history of Concrete Music which started by Pierre Schaeffer in 1940's I found the process of making Concrete Music is completely same with my style of filmmaking. The process of "concrete music" is not making concrete music from abstract sounds. 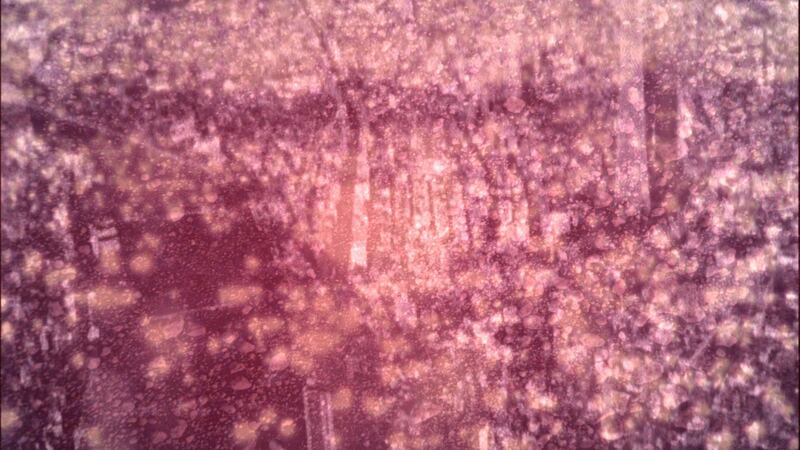 but making abstract music from concrete sounds (already existing sounds). I can say this film "cinéma concret" is one of the answer from 21 century's filmmaker for Pierre Schaeffer and Concrete Music, and also one of the ironical interpretation for the history of the abstract cinema.